No More Going to Ankara, Istanbul or Abroad! MEMORIAL is in Antalya! Memorial Health Group which contributes to cure of hundreds of thousands patients each year brings its perfection standards in health services to Antalya by Memorial Antalya Hospital. Memorial Antalya Hospital will be a world hospital thanks to its superior technological facility, internationally recognized and powerful team of doctors, perfect and efficient patient care. Memorial Antalya Hospital, being established on a 15 thousand-square meter-area and having a medical and administrative cadre of 400 people, will serve not only Antalya but all the Mediterranean Region and become the address of health services of high quality along with 114 patient beds, 18 observation beds, 4 intensive Care Units (General, Cardiovascular, Coronary, Neonatal) and 28 ICU beds and 5 operation rooms which provides advance service inspired by the most recent technology. By PACS system which provides a hospital without filming, the radiology department equipped by the advanced devices, MR and BT rooms, intense care units which provides the patients the perceptions of day and night, Coroner Angio and Angio service as well as the policlinics which are decorated influencing the psychology of patients in a positive way, the patient rooms and modern architecture, Memorial Antalya Hospital will provide its patients both quality and comfort. In Memorial Antalya Hosptial in which the world-famous academic staff of the hospitals in Istanbul will attend seasonally, thanks to the PACS system (the hospital without filming feature) the imaging and laboratory results will be shared and thus a medical synergy will prevail. da Vinci, Following Istanbul and Ankara, is Now In Antalya! ‘da Vinci Robotics’ which is recognized as the latest technological advance in the medical world and is utilized in especially important centers in the USA as well as all over the world, will be in Antalya after Istanbul and Ankara. “da Vinci” will be utilized in many branches especially in urology and gynecology in the da Vinci Robotics Surgery Center of Memorial Antalya which is the first and the single robotics surgery center in the Mediterranean Region. Memorial Antalya Hospital, the third hospital of the Memorial Health Group which is the leader in health services of high quality, will be a reference center in the region . Also admitting patients from 65 countries of the world, will also be an important center in terms of health tourism. 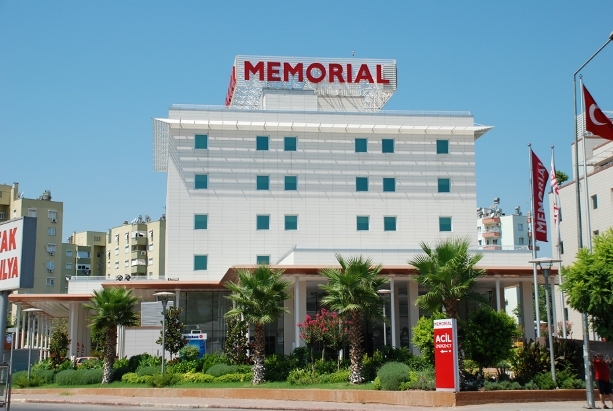 Memorial Antalya Hospital, located in the Centrum of Kepez, being accessible easily and close to the holiday towns, the airport and the bus terminal, will be in the service for every branch in 7 days and 24 hours along with the experienced academic staff, the cheerful employee and superior infrastructure and technological equipment.